Health equals wealth for Sammy Watkins and Bills who put up better numbers last year and played in only 13 games hampered by ankle and foot injuries that carried into the preseason. 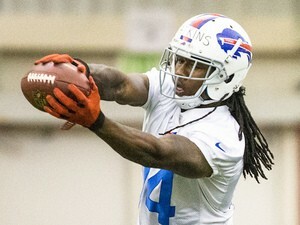 Watkins will be ready to go Week 1 in Baltimore and fans would like to see what are the Bills intentions on getting him the football, last year at times Watkins was barely targeted early in games during the first half of season. With another year with Taylor as his quarterback the chemistry should off and running .